The Chernomorets Stadium is a football stadium built in 2011 in Odessa, Ukraine. The stadium has a capacity of 34,164 and is the home of FC Chornomorets Odesa. The inaugural match, between FC Chornomorets Odesa and FC Karpaty Lviv, was played on November 19, 2011, and ended with a 2–2 draw. The first goal was scored by Vitaliy Balashov in the 46th minute from penalty. 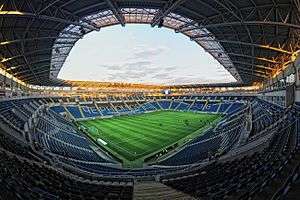 The stadium was constructed on the site of the old Soviet multi-use Central Stadium of the Black Sea Shipping Company (ChMP), which was demolished in 2009. The venue was considered to be one of the stadiums of EURO 2012 but failed to be nominated as such. The former ChMP stadium was built on the same site in 1935, and it was originally named as the Kosior Memorial Stadium after the First Secretary of the Communist Party of the Ukrainian SSR. After Stanislav Kosior was repressed in the 1930s, the name was changed to Shevchenko Park Stadium. After World War II, the stadium was passed to the ownership of the republican Ministry of Food and received name as the Central Stadium Kharchovyk. At the end of the 1950s, it was renamed as Avanhard Stadium after the Ukrainian Sport Society of industrial workers. In 1959, the stadium was renamed to the Central Stadium of the Black Sea Shipping Company or alternatively Central Stadium Chornomorets. ChMP could hold 34,362 people. It hosted the Ukrainian Super Cup from 2004 until 2007. At the end of 2008 it was closed and, in 2009, it was demolished. ↑ "Looking back and future prospective in Ukraine". Consulate General of Ukraine in Chicago. Archived from the original on 2012-04-25.